"we can not continue to fight. Many of us no longer have a gun, and those who have, have hardly any ammunition! 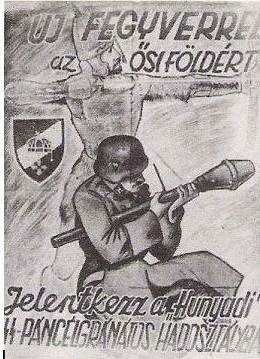 Besides, if the Germans want us to fight, they should provide us with a gun and ammunition properly"
Hungarian grenadier 12.02.1945 Alarm Battalion - Battle for Neuhammer. 07/05/2017 - Additional information to "WSS-XVII Armee Korps"
08/01/2018 - Information added to "Hunyadi"2 and "Sources/Credit"
02/05/2018 - Information added to footnote 3 on "Gombos and other other divisions". 29/06/2018 - Information added to footnote 3 on "Gombos and other other divisions". We would like to thank you for visiting this website and making it so successful. As time allows further information will be added as it becomes available and we have time to translate it. We hope you find the information contained on the following pages informative.